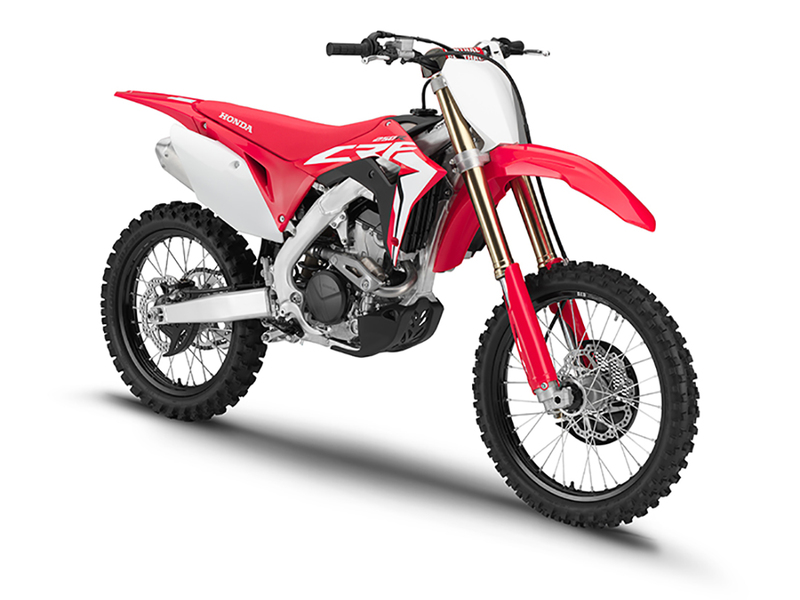 Honda's most competitive, durable and formidable 250cc race machine to date has some exciting updates for 2019! High-performance, 249cc single-cylinder engine with dual-overhead-cam design and high rev limit, offering great performance. Finger rocker arm with Diamond Like Coating (DLC) maximizes valve lift while retaining a low engine height. Downdraft intake layout produces strong power and enables great throttle response by reducing resistance, thereby improving air-charging efficiency. Dual exhaust ports enable ideal air-charging efficiency. Electric-start standard for easy, fast engine startup. Easily selectable Standard, Smooth, and Aggressive riding modes enable easy tuning depending on rider preference or course conditions. Selectable HRC launch control provides a steady stream of torque for excellent performance on race starts. New cam profile based on feedback from the Team HRC factory MX2 race team provides strong off-corner acceleration. 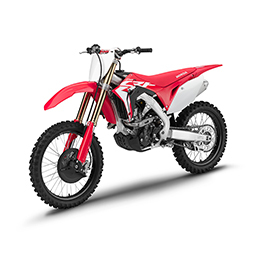 New intake- and exhaust-port geometry improves low rpm engine power while also maintaining the CRF250R's top-end performance. New 44mm throttle body improves low-rpm intake airflow compared to previous 46mm version, for improved corner-exit performance. All-new piston oil jet uses five nozzle holes instead of four, for improved piston-cooling efficiency and reduced knocking, enabling a precise ignition-timing setting for optimum power delivery. Right-side exhaust pipe shortened 50mm for excellent high-rpm power. All-new AC generator reduces weight and friction losses. Lightweight aluminium frame with tapered main spars provides great rider feedback. Low centre of gravity reduces front-end lift for strong acceleration performance. Lightweight and compact titanium tank keeps weight to a minimum. Smooth bodywork layout eases rider movement. In-mold graphics are durable and resistant to peeling caused by washing or abrasion. Geomax MX3S tires for superior bump absorption and grip in wide variety of conditions. Renthal Fatbar® reduces weight of the steering system, and flexes for optimal comfort. Top triple clamp features two handlebar-holder locations for moving the handlebar rearward and forward by 26mm, ensuring rider comfort. When holder is turned 180 degrees, the handlebar can be moved an additional 10mm from the base position, resulting in four total unique riding positions. New engine guard allows increased airflow, improving engine-cooling performance. Redesigned fork protectors offer improved coverage. Black rims deliver a strong presence on and off the track. New, lighter front-brake caliper now uses pistons of different diameters (30mm and 27mm) for strong braking performance. Updated front brake hose has reduced expansion for more precise braking. Newly shaped footpegs are 20% lighter and shed mud more easily, giving the rider great feel and confidence in all riding conditions. Overseas model shown. Accessories not included.